Following the CMA’s recent release of public submissions to their funeral market investigation, we had a good read through the submissions and have a few critiques to share concerning the submissions from the NAFD (an industry trade association) and Dignity PLC (operator of 800 funeral home branches, crematoria and the largest non-founder owner of FuneralZone). We’re happy to publish any replies here. This is incorrect on several fronts, but firstly we would like to call out the hypocritical nature of this ‘concern’. It appears the NAFD’s issue is that commercial operations are presenting material to bereaved people within NHS bereavement offices. Many hospitals have, for many years, engaged commercial partners to produce literature to help the bereaved. This literature is typically provided free of charge under the agreement that the company producing the literature can include advertisements – typically from funeral directors, solicitors, property valuation specialists and similar businesses. Many NAFD members, including the large chains, advertise in these booklets. The largest provider of these booklets is a company called R N S Publications. 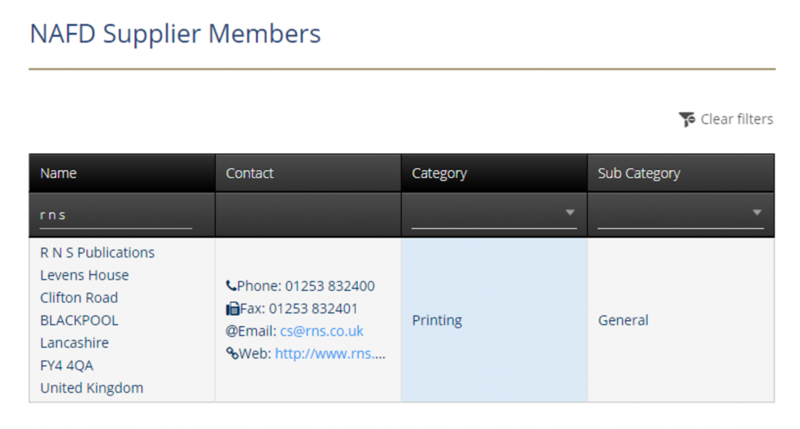 R N S are a supplier member of the NAFD, as shown on the NAFD’s website below. We have previously spoken to R N S about placing adverts for our services in their publications. However, they would not let us advertise in it. The reason given was that “This would upset the funeral directors who currently advertise with us”. So, the NAFD are complaining that price comparison websites (which promote transparency of pricing for consumers) are producing literature for the bereaved in hospitals, when the NAFD’s supplier members and funeral director members have been doing the exact same thing for years, and have furthermore deliberately restricted the ability of price comparison websites to as they do – creating a closed shop. We don’t “only include the details of those funeral homes that have paid to be listed” on our website. We also include the prices of 800+ Dignity PLC branches on Beyond. Dignity do not pay us anything whatsoever: we have listed their prices simply to provide transparency for consumers, so that the families who use our site can see what they charge. Secondly, funeral homes do not pay to be listed on our website – they pay a commission on successful funeral arrangements passed through to them. We should also note for clarity that we are not a preferred supplier for any hospitals. We have been approaching hospital bereavement offices over the past year and speaking to numerous people within the trust (e.g. Bereavement Officers, Chaplains, Heads of Nursing etc) about who Beyond are and what we do. We will, if the hospital staff deem it useful, provide materials for the hospital free of charge. These materials include a 20 page “Insider’s Guide to Arranging a Funeral” and a double-paged contact flyer. The staff at the hospital, if they think the materials are useful, decide to display them. There are now nearly 200 large general hospitals across the country who have decided to do so. We believe that our booklets provide a superior level of information, addressing practical issues to the benefit of the reader. It is for this reason that many hospitals have decided to support us. The NAFD states they are exploring: “whether there are ways of improving the information presented to bereaved families to ensure they have a comprehensive choice that is not influenced by commercial considerations”. It is amazing to us that they think that being a trade association excludes them from having commercial considerations. The NAFD’s response displays either a deliberate protectionist attempt to distort facts or a worrying lack of intellectual rigor, either of which undermines their ability to act as a capable or credible voice for the industry. Where is the dialogue with Beyond or other comparison sites? Or even non-NAFD members? Page 18 – given the increasing prevalence of online comparison sites, many of which are not offering a proper like-for-like comparison. Providing a like-for-like comparison is a key benefit for consumers. At Beyond, we ensure this by requiring funeral directors to provide an itemised price breakdown for over 30 service items. This creates a pricing structure where a customer can swap and change various elements while knowing they are looking at a like-for-like price. Page 20 – Funeral firms are paying a variety of fees for participation, seeking a competitive edge over their competitors by paying to achieve a better position on the website. Beyond would like to categorically state that no funeral director pays to achieve a better position on our site. On the comparison results screen for traditional funerals, funeral businesses are listed by geographic proximity to the customer as standard. A customer can then further sort by price or reviews if they wish. Page 20 – There is no quality control of those firms who are listed on such sites as membership of a trade association which undertakes inspections is not a requirement for sign up. This also means that client redress is not available either. In terms of redress, why does the NAFD assume they are the only ones who provide client redress? It is more in our interest, as a company with a brand to maintain, to provide client redress than the NAFD. We would like it to be recognised that we have removed funeral directors who have not met the standards we would expect. For the very few disputes we have encountered, we have provided a resolution to the issues as needed. At its heart, our business is about connecting and helping people to find good funeral directors and have good funerals. Resolving disputes is part of what we do. Page 20 – There is also a question about how truthful such sites are being, as we are aware of numerous instances of firms finding themselves listed on the service without having given permission. Dignity plc is one such firm, having discovered their branch details and prices listed on beyond.life without their permission or any request for fact checking. Since publishing that piece, we have met with Dignity representatives regarding their pricing. We went through an exhaustive fact check on their pricing with them and it was found to be accurate bar the cost of one type of coffin, which we have since updated on the site. The NAFD raise their view that PCWs – price comparison websites – charging funeral directors a fee is an issue. The implicit understanding is that their http://www.funeral-directory.co.uk/ service is free and will remain so. This is supported on page 23: “provided free to NAFD funeral firms, as a benefit of membership, will be free of advertising and will be free to use for consumers”. At a minimum, we would hope the NAFD would be able to clarify this and, if there are any fees likely to occur, how this would be demonstrably different from our service. The data demonstrates that this is not true. There are 197 crematoria within 10 miles of each other. That is 69% of the total 287 crematoria. Of course, this does not mean that 69% of customers have two crematoria within 10 miles but it is indicative that there should at least be the potential for decent competition between crematoria. 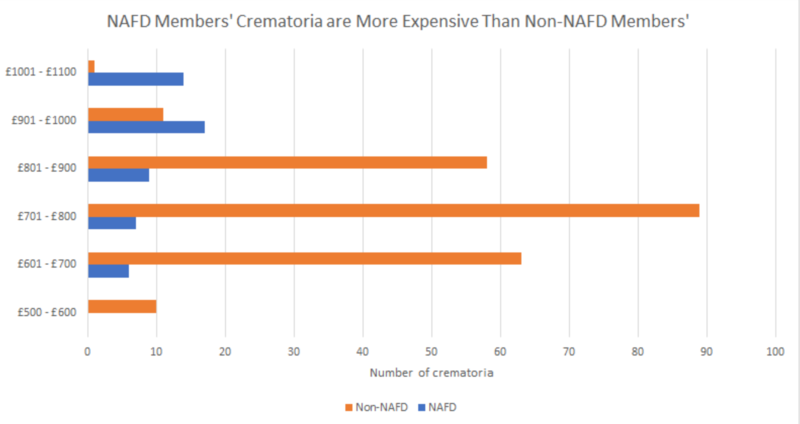 We believe the attitude that “crematoria can’t compete because of x and y” demonstrates a significant lack of ambition on the NAFD’s part, perhaps incentivised by the fact that its second largest member, Dignity PLC, owns the UK’s largest portfolio of crematoria (45 sites). The NAFD has focussed its response on one aspect of costs: namely, increases. However, this does not show a full picture of cremation costs in the UK. The crucial part that is missing is the large impact that the NAFD’s own member firms have on cremation costs and poverty. The average cremation fee at a non-NAFD crematorium is £755. At an NAFD member crematorium it is £912 – that is a premium of 21%. The below chart shows how NAFD member firms dominate the most expensive categories. 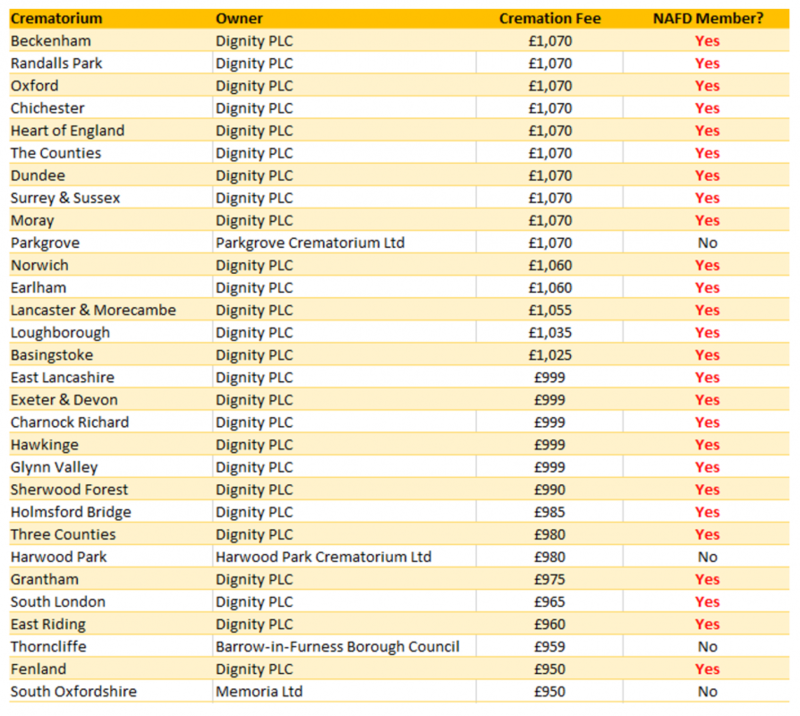 The below table shows the 30 most expensive crematoria in the UK. You will notice how many of these are NAFD members and, of course, how many are owned by Dignity PLC. Dignity PLC is clearly a large contributor to cremation pricing at the top end of the market. By analysing its publicly reported figures, we can also gain an insight into how Dignity has increased its average revenue per cremation over the past decade. The below table shows how the average revenue has risen from £570 to £1,167 between 2005 and 2017. Dignity states that this revenue covers “cremation services and the sales of memorials and burial plots at Dignity operated crematoria and cemeteries”. Although it is impossible to split out the exact contribution from cremations alone, we believe these numbers are broadly representative of the increasing cost of a cremation with Dignity. A sustained CAGR of 6% plus is well above what local authorities have done over the same period. This is a reductive argument that does not lead anywhere useful. Cost is a fundamental part of any purchase and the industry (and indeed, society) needs to find a way to deal with this better. The alternative is customers paying more than they need to, and the practices that are prevalent today that encourage this. Fundamentally, the NAFD is trying to represent a broad range of businesses. Some of these benefit from price transparency and purchasing efficiency (we would say these are the portion of their members who use our website) and some of them will not benefit (the old guard, large chains). That divide is what leads to the conflicting statements above. This is very hard to prove conclusively (whether there be an increase or decrease) without internal documents from each of the companies. To the best of our knowledge, Co-op and Dignity have reduced their prices for certain elements of a funeral, or for heavily restricted funerals, only. The best proxy for whether a business has actually reduced the prices it charges is to look at average revenue generated per funeral. It is all very well to drop a single headline price but if this is not the service that people choose, or that they are offered, then it does not have any impact. To calculate average revenue per funeral, simply take the total funeral revenue for the each business and then divide by the funerals performed. Dignity has clearly enjoyed many years of average revenue growth. Customers are paying more. The same analysis is only possible for Co-op over a short period since it has changed its accounting practices multiple times. This means that a comparable analysis for prior or following years is not possible. The point we would like to make is that it is very easy for firms to publicise a drop in costs by picking out specific elements that they have reduced – however, the idea that this actually filters through to the total price customers pay is open to debate. NAFD Page 5 – The price of higher-end funerals has consequently risen at a faster rate than funerals at the less-expensive end of the spectrum. Supposition. We think this an attempt to try and link a higher priced funeral to a higher-end funeral. In our experience, price does not have a great influence on the quality or substance of the service provided. An important element of the debate is missing here. Principally, what typically causes a shortfall in fees. With regards to 1: if the proceeds from funeral plan sales are managed prudently, then it should be possible to match general increases in cost inflation. For a large fund, anything between 2-4% should be feasible over a period. However, if a fund owner is able to extract fees and dividends, then it becomes less likely that growth will cover costs. With regards to 2: even the best fund management will not ensure adequate funds if the amount paid into the “pot” to start with is lacking. There are well documented cases of high commission fees, “marketing” costs etc. eating into this amount (see Fairer Finance in particular). We feel it is important to include both of these points, which we consider to be the ones that have the largest impact, in any discussion. The NAFD’s opening line, which sets the tone for their response to this question, is directly refuted by their own data earlier in the report. On page two they reference YouGov’s finding that 84% of people didn’t compare prices and that 66% say this is because they know who they will use. To us, these figures do not evidence “healthy competition”. NAFD Page 9 – some funeral directors position themselves as offering premium services and products, while others will target themselves towards the more budget conscious families. The costs of delivering that service will vary as a consequence. The NAFD is trying to insinuate that “high price equals high quality”. We do not believe this is the case in the funeral industry at present. Given there is no adequate price pressure exerted by consumers, it is far too easy for poor quality businesses to increase prices. Until there is price and service pressure from consumers, there will always be room for poor businesses to thrive. The hotel and travel market is a great example of what the funeral industry is not. It is incredibly easy nowadays to use the internet to gain an accurate picture of the service being offered at any given hotel and assess it rationally compared to its peers. This, of course, has largely been driven by price comparison websites and sites like as Airbnb, which have driven a democratisation of information and allowed customers to exert normal market pressure. The NAFD is trying to imply that because it is the largest organisation of funeral directors, only a comparison site created by itself will be in the best interest of its members. It is also trying to spin the line that any site it creates will be “non-commercial” as opposed to a “commercial” site (their definitions, not ours). These are both patently false. The NAFD represents commercial organisations and generates membership fees from these members. All of its activities are commercial. Fundamentally, the NAFD, with its own website, is going to have to try to cater to the interests of its diverse membership base. This includes those funeral directors who are happy to be transparent about prices – and those who are not. This is what leads them to say: “Members will also be strongly encouraged to add pricing information to the site in the second phase”. This is clearly not in the interests of many of its members, particularly those who are happy to be transparent about prices. Our website happily caters to the hundreds of NAFD members who are prepared to be transparent about pricing and we are proud to have their support. It is very interesting to see that only 1% of people check a price comparison website. From our perspective, this highlights the necessity to raise the awareness of PCWs plus empower people to use them. It appears odd to us how the NAFD, within the space of a page, explains why it scrapped the need for funeral directors to provide a “Simple” funeral price, saying that it caused numerous issues, before declaring that: “funeral-directory.co.uk intends to create a ‘simple funeral’-style set of parameters”. Fundamentally, a “Simple” funeral style system is critically flawed because it allows a business to game the system. Most businesses will know that once someone is in their branch and assessing the options, the simple will no longer be appropriate. This incentivises businesses to post a low “Simple” price online to encourage people to get in touch. These people can then – maliciously or not – be upsold a higher price funeral. The only way to restrict this behaviour is to post prices and comparisons across a range of services that match what the customer wants, BEFORE they go into the funeral director’s premises (as we do). Simple style parameters are simply a bad option. A recent analysis by research agency Matter Communications for Dignity has concluded that there are currently approximately 7,000 Funeral Directors across the UK. We strongly dispute that there are anywhere near 7,000 funeral directors in the UK. We think this is an attempt by Dignity to insinuate that there has been an explosion of businesses in recent years – with the implicit view that new businesses will be “fly by night, low cost operations operating at the edge of respectability”. We think it is an attempt to push the idea that registration or regulation of funeral directors should be mandatory. 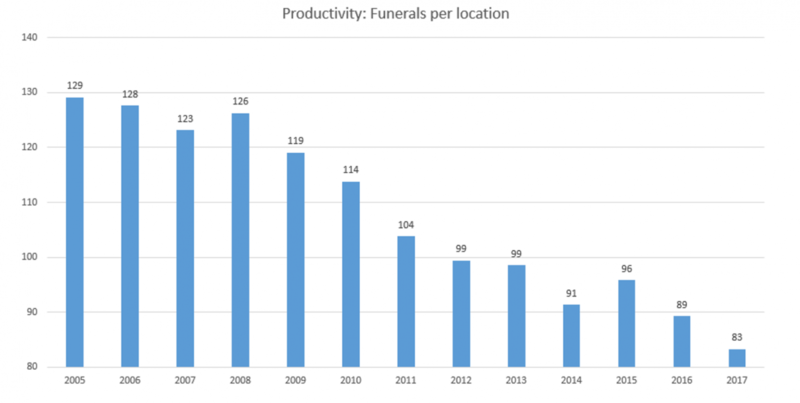 Our own data indicates that there are roughly 5,900 funeral director locations (with the number of businesses being far lower given that individual businesses often own more than one location). This is the split: c.3,800 independent locations (including regional co-ops), 1,100 Co-op locations, 830 Dignity locations, 150 Funeral Partner locations. Our data is based upon our constant outbound efforts to approach funeral directors. This involves actively contacting all funeral directors. We discover new ones and remove closed ones constantly. In this manner, we maintain an accurate database of active funeral businesses – we suspect it is the most accurate database available. a) Why have funeral prices generally increased? We notice that in its response to part a) Dignity has failed to talk about the impact its own price rises have had on the industry. As we mentioned above, while price alterations are hard to prove conclusively without internal documents from each of the companies, to the best of our knowledge, Co-op and Dignity have reduced their prices for certain elements of a funeral, or for heavily restricted funerals, only. To reiterate our earlier point, the best proxy for whether a business has reduced the prices it charges is to look at average revenue generated per funeral. It is all very well to drop a single headline price but if this is not the service that people choose, or that they are offered, then it does not have any impact. To calculate average revenue per funeral, simply take the total funeral revenue for each business and then divide by the funerals performed. g) What are the benefits or limitations of intermediaries, such as comparison websites, in helping people choose a funeral director? It is difficult to know where to start with Dignity’s response regarding price comparison websites. They start with some general platitudes about supporting PCWs in principle and then go straight into listing multiple facile assertions with no evidence or detail supporting them. We will list them all below and respond as appropriate. PCWs allow funeral directors with commercial arrangements to develop their own content describing their business and services – correct, all businesses who have voluntarily signed up to us can edit their own profiles. The one business which has not voluntarily signed up to us (Dignity PLC) cannot edit their profile. However, no funeral director can edit their own reviews. This whole section is clearly aimed at trying to discredit PCWs and ourselves. “Unsworths Funeral Directors, located in Cooper Street, is a branch of the large corporation, Dignity PLC. Although Dignity branches use local family names such as Unsworths Funeral Directors, this is usually just for marketing effect. Behind the facade, it’s a corporate national chain. Dignity are generally significantly more expensive than the average funeral director. They do not publish their prices transparently online, so we gathered their paper pricing sheets and uploaded them into our website format for easy comparison. To be honest, we think that fairly describes the situation at a Dignity branch. Dignity also talks on numerous occasions of a willingness to work with price comparison websites. We would note that over nearly four years of existence Dignity has shown no willingness to engage with us on either our business, price transparency or PCWs in general. Obviously, we are not the right type of price comparison website for them! It is unclear who owns some Price Comparison Websites in the funeral sector, so there may be conflicts of interest if Funeral Directors, or their backers, own these websites. Our ownership is publicly available on Companies House, as is the same for all companies. We are owned by a mixture of employees, angel investors and venture capital firms. None of the investors are funeral directors or have specific interests in the funeral sector other than us. It is joyfully ironic for Dignity to raise this as an issue, however, given that they invested c.£1m in FuneralZone in 2017. Dignity are now their largest shareholder outside of the two founders. b) What explains certain large funeral price differences between funeral directors in the same local area? We believe Dignity’s response is pure obfuscation. In Dignity’s own recent survey, they find that only 21% of people considered more than one funeral director, which automatically disproves the second point above. Further within the response, Dignity also says: “Consumers do not currently have a clear understanding of the differences in quality and standards between Funeral Directors”. Clearly, Dignity do not actually think people can assess quality. Within Dignity’s response, there is also a constant tone that its service is of a superior standard to others and that the price is worth paying. We think there is a simple metric that proves this is not the case. Dignity’s annual reports show that the number of funerals they perform per location has collapsed from 129 in 2005 to 83 in 2017. Given that Dignity have already established that people to do not, on the whole, compare funeral directors, this can only mean that the collapse owes to previous customers deciding not to use them again. People simply do not value the experience they get from Dignity. It is our belief that if customers were able to adequately compare funeral directors, this graph would look even worse for Dignity. Dignity only manages to maintain overall customer levels through the purchase of currently successful businesses each year. So, coming back to the question: what explains the large differences? The answer is the simple and obvious one – too many customers do not adequately assess quality and price. Whenever this happens in a market, some providers will choose to raise prices as far as they can, and others will not. Dignity’s prices are at the top end of the scale, which is why it uses a convoluted and contradictory argument that states that consumers value quality and will pay for it, yet also asserts that they don’t actually do this. r) Why have cremation fees generally increased and why do they differ across the UK? Somewhat predictably, Dignity has forgotten to provide any insight into how its own practices might have influenced cremation fees. 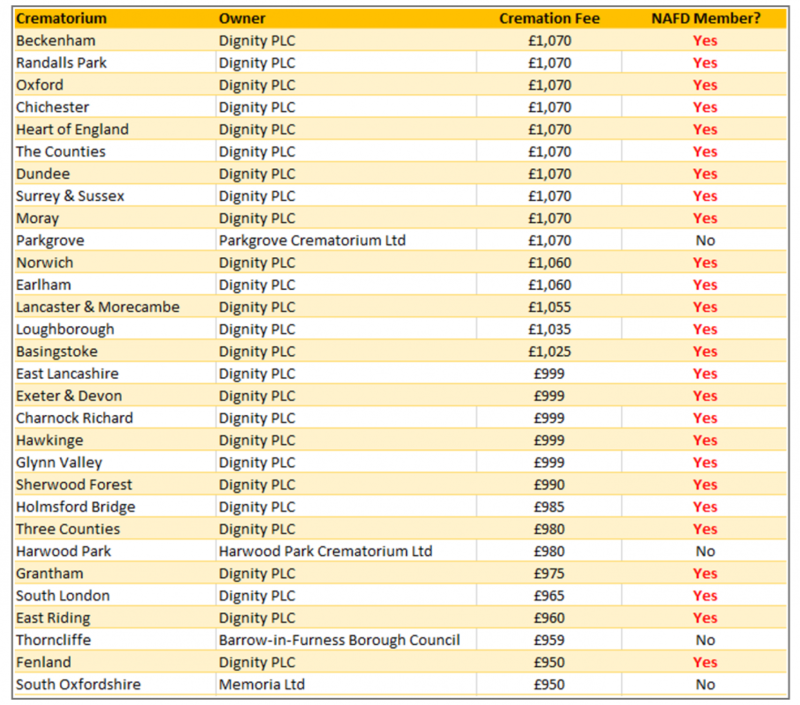 The below table shows the 30 most expensive crematoria in the UK. You will notice how many of these are owned by Dignity PLC. As we noted above, Dignity PLC is clearly a heavy contributor to cremation pricing at the top end of the market. By analysing its publicly reported figures, we can also gain an insight into how Dignity has increased its average revenue per cremation over the past decade. The below table shows how the average revenue has risen from £570 to £1,167 between 2005 and 2017. Dignity states that this revenue covers: “cremation services and the sales of memorials and burial plots at Dignity operated crematoria and cemeteries”. Although it is impossible to split out the exact contribution from cremations alone, we believe these numbers are broadly representative of the increasing cost of a cremation with Dignity. A sustained CAGR of 6% plus is well over what local authorities have done over the same period. g) “This [the PCW fee] only succeeds in adding costs to the FD, squeezing their margins, which conversely will therefore increase costs and provide less scope for a reduction in prices! This is only partially true. A fee charged by a price comparison website is, and always will be, a marketing cost for a business and should be treated as such. At Beyond, we operate what is in our opinion a supplier friendly model – we do not receive a fee for leads. Instead, our fee is only chargeable once a customer has definitely used the funeral director and this is only chargeable post-funeral. There are no listing fees or other costs associated with being on Beyond. Each funeral director who uses Beyond is making a rational assessment that they are happy to pay our fee when a guaranteed customer uses them. In return, they receive this guaranteed customer plus any other customer who uses our site as a research tool but then does not enquire through us. Thanks Beyond. I like the spirit and the clarity with which you operate. Having worked as an independent for a long time and briefly for Dignity I concur with all your findings. However “Caveat emptor” there are other players in the market now who heavily advertise a low price then upsell hard to the bereaved families. 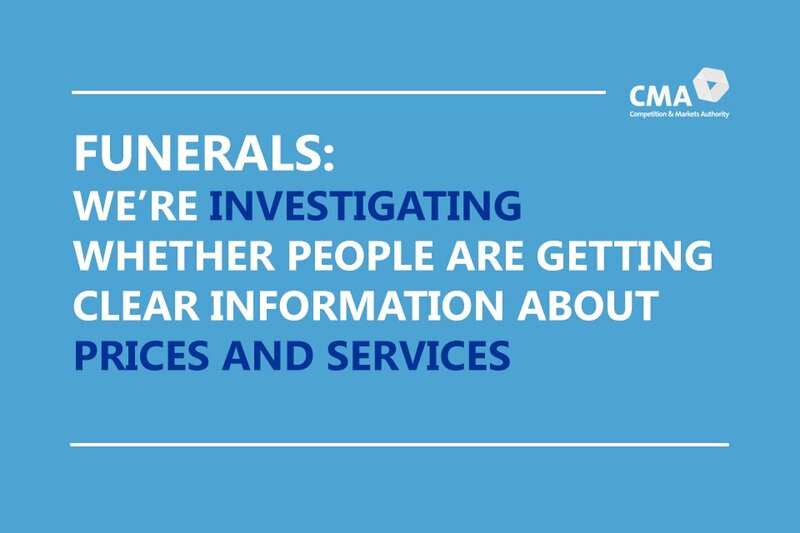 In a few weeks’ time, the CMA will publish a report concerning its enquiry into the funeral industry. The focus of this enquiry – and indeed, the focus of much of the media coverage around the industry over the last few years – has been cost. Are funeral costs going up or down? Are prices transparent? What can we do to help consumers with the cost of funerals? And so on*. *The answers, by the way, are: flat for independents, up for chains; transparent for around 20% of the industry; and encourage people to use comparison websites. These are worthy questions, and (disregarding my own self-interest here) it would be difficult for anyone to dispute the fact that Beyond has made huge strides in addressing the issue of price hikes and transparency over the last few years. Because of our efforts, Dignity have been reduced to calling in the management consultants, and Co-op have (laughably) begun claiming to have started a price war (without actually publishing any pricing, but that’s a blog post for another time). The move towards fair transparent pricing throughout the industry is gradual, but likely now inevitable. But is it enough to simply make traditional funerals more affordable? Is that all that we can do to make bereaved families feel that we, as an industry, are meeting their needs? I’d argue that it isn’t. When we talk about cost, and the public’s dissatisfaction with the cost of funerals, what we should really be talking about is value. Sure, people aren’t happy paying £5,000 for a traditional funeral with hearse and limousines – but in many cases, they wouldn’t be happy paying £500 for it either. It’s just not the service they’re looking for. As an industry, we aren’t offering families a lot of choice. Yes, there are options out there if you dig around – you can find suppliers for anything from rockets that shoot your ashes into the air, to flammable Viking longboats. But these suppliers don’t (yet?) have the budget to advertise nationally, and many funeral directors don’t exactly push them. A lot of us in the business, intentionally or not, steer families towards a pretty standard format funeral. And when you’re bereaved, feeling under pressure to organise a send-off – any send-off – and you know nothing about the industry, you’re not in any state to research different options. But families do want more choice, and we’re beginning to see some pushback. Direct cremation is growing in popularity, for one. Often in a Sunday supplement or similar you’ll see articles about it: “Bury me in the garden”, “Stick me in a cardboard box”, etc. Many take a deliberately reactionary stance – rebelling against a status quo that dictates that a traditional funeral is the only “proper” option by shunning a funeral altogether. That’s not surprising. It’s a lot like the dissatisfaction that many people feel with politics right now – “I don’t like any of the parties, so I won’t vote at all”. Direct cremation is also the least expensive of all the current options. But this recent increase in interest in direct cremation doesn’t mean that this is how the market will go or that it’s what people really want. Direct cremation is just the one of the few alternatives to a traditional funeral that’s easily available. So, what do bereaved families actually want, if not a traditional funeral? Now, there’s no shortage of vocal factions promoting their own understanding of what families want, which generally correlates perfectly with something they are selling, whether that be service or a product. But I’d argue that no-one knows what consumers want, because we, as an industry, haven’t been asking them. At least not properly, in a rigorous way. To find out what the bereaved want, you need to ask them at the point of bereavement. You also need to offer them a wide variety of options, options which may not even exist yet. You also need to ask them in the exact same way each time, without the biases of different funeral directors, contexts or sales materials affecting their decision. And you need to ask a lot of people – at least 1,000 for any kind of statistical significance. It’s only now, at Beyond, that there are enough bereaved people going online and choosing funeral arrangements to create a data set that’s robust enough to analyse. And analyse we do. We constantly run tests across our website, much like any online business, to try and understand what users want. Sometimes we invent a service and put it up online for a few weeks to see how much interest it gets. We might take it down again because no-one has clicked on it, but we still count that as a success, because the result is that we understand the consumer – bereaved people who need our help – better. However, if people really like that service, we may look to develop it. This could be in tandem with our funeral director partners, or we might build an in-house offering, such as with estate administration. In that instance, our partners can then benefit by offering it to families themselves, increasing their service breadth. Some of our partner funeral directors would rather we didn’t test. They see every new potential development on our website as a challenge to their business and post furiously about it on social media. This is short-sighted. Over the next few years, the funeral industry is going to change more rapidly than anyone can imagine. It’s becoming ever-more-obvious that families are seeking different services, different ways to interact with funeral directors. If individual funeral directors are not prepared to keep up with the pace of change, to invest in technology or partner with technology providers, to work in new ways, then they will stagnate. Because the chains certainly won’t sit still. Dignity, despite previously being guilty of falling asleep at the golf buggy wheel, are now investing £50m in overhauling their business, introducing tablets, technology and home visits. The Co-op machine will likely respond in kind. And Dignity have the crematoria as an asset. You can see the benefit of that with their new “full-attended cremation service”, booked over the phone. Will it be popular? I don’t know, but I’m impressed that they are testing new products for their customers. We’re interested to learn as well, so we’ve popped a similar product up on our website to find out whether this is the future or not. For the first time in decades, we are starting to discover what consumers – bereaved families – really want. We need to be open to this journey of discovery and adaptable to the changes it will bring. Those funeral directors that entrench solely around their traditional offerings and reliance on walk-ins for customer acquisition will slowly but surely die out. Those that embrace the testing, learning and development of new products to serve the changing needs of the bereaved will flourish. Change is coming. Let’s embrace it, learn together and better serve the families who need our help. The people of Blackpool have the lowest life expectancy in the country — almost five years below the national average — new analysis from funeral comparison website Beyond has found. Residents of the seaside resort now live to an average 76 years and 11 months — eight years less than those in longevity capital Kensington & Chelsea. 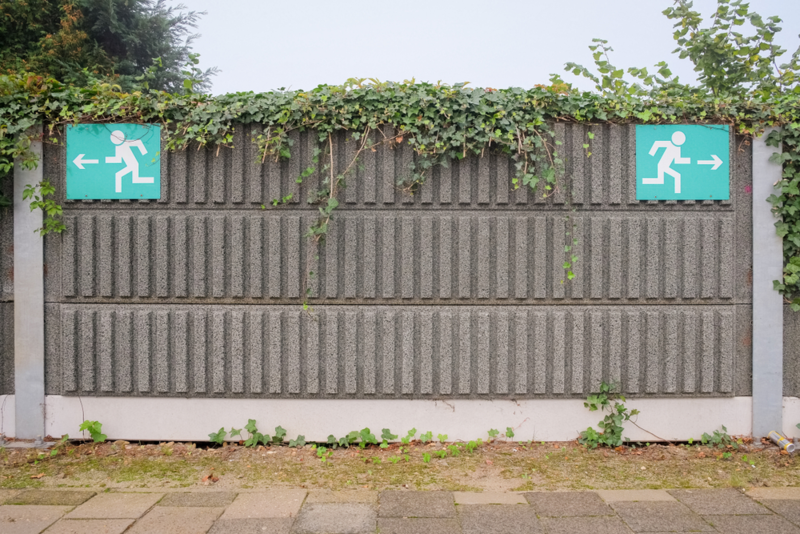 The research is the first to identify true overall average life expectancy for each place by using gender population data to weight the life expectancies of men and women fairly and accurately. Life expectancy in the UK is now 81.6 years. Mancunians do not live much longer than residents of Blackpool, at 77.4 years – more than 5% lower than the national average – with Middlesbrough, Hull and Liverpool completing the bottom five places for life expectancy. Meanwhile, people in Kensington & Chelsea live the longest, beating the national average by 3.5 years and reaching the ripe old age of 85.1. All ten places with the lowest life expectancy are in the North, while the top ten places for life expectancy are within 40 miles of the City of London – with eight of the top ten falling in London boroughs. Life expectancy can be attributed to a variety of factors, many of them surrounding quality of living and health resources that reflect the socio-economic divide between the North and the South. One other area where the poverty line has an impact is in will writing. The majority of the country (60%) have never written a will, a crucial preparation for what happens after life, despite Beyond leading the way by offering a free will writing service. “The North-South divide is alive and well in death it seems. “But it doesn’t just stop at death. Northerners are penalised after life too. “Because of cost concerns, fewer people in the North get around to making a will, meaning they are more likely to die intestate than Southerners.